The greatest threat to coral reefs is the warming of the oceans. The global threat comes from climate change combined with El Niňo a natural periodic increase in global ocean water temperatures associated with a change in the atmosphere and the Pacific Ocean. The 1998 El Niňo caused an estimated loss of 16% of all corals worldwide, but in the Maldives estimates were as high as 90%. Coral reefs recovered, but in 2016 we experienced the most severe global bleaching event in recorded history, with particularly high coral mortality in the Indo-Pacific oceans. Corals live close to their thermal threshold, thus they are particularly sensitive to elevated water temperatures which can cause them to “bleach” from only half a degree temperature rise. Corals are animals with symbiotic algae living inside them (“sym” = together, “bio” = life). Algae photosynthesise and produce food for corals, while waste produced by the coral animal provides food for the algae. However, when the water gets too warm corals expel their algae, leaving them looking white or “bleached”. If the water cools the algae return, but if it stays warm for more than a few weeks, the corals do not get enough food and may starve and die. At Banyan Tree resorts in the Maldives, water temperature is recorded year round at multiple depths every hour by submerged data loggers. Read outs are checked regularly and the eyes of marine lab staff and the many citizen scientists act as warnings of imminent bleaching. 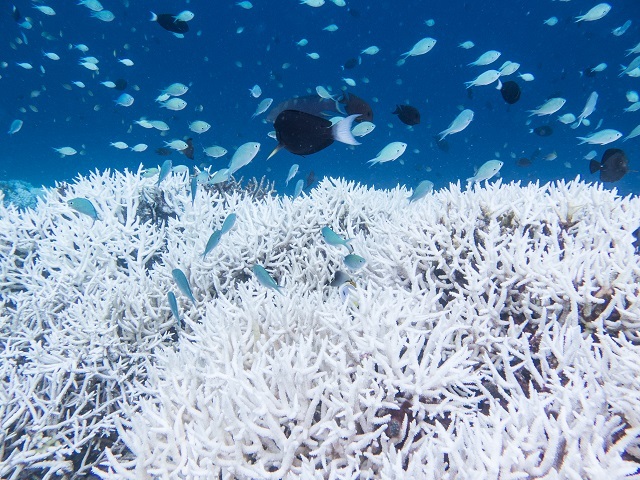 The extent and severity of bleaching events are carefully monitored as well as the response of the fish community and subsequent reef recovery. Impacts from 2016 were widespread and severe. So what can we do? We can assist the resilience of corals by reducing other forms of stress (such as sedimentation). We can also assist natural recovery through transplanting corals from our nurseries. Guided by our Bleaching Response Plan, with extensive restoration experience from our dedicated marine lab team and assistance from guests and staff alike, post-bleaching restoration efforts focus on areas that have been most heavily impacted to assist and expedite natural recovery.